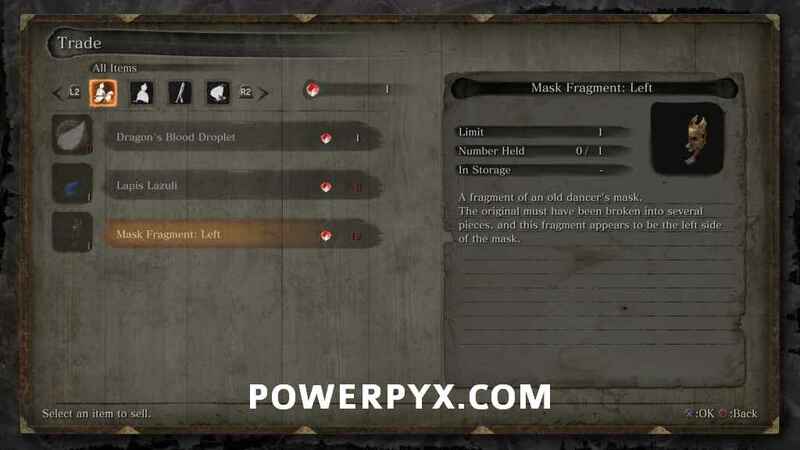 In Sekiro Shadows Die Twice you can find 3 Mask Fragments to build the Dancing Dragon Mask. 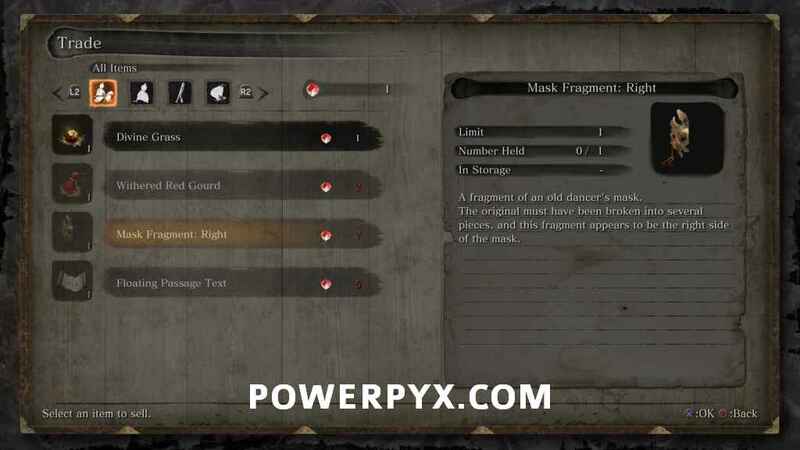 This guide shows all Sekiro Mask Fragment Locations in chronological order. The last one is missable as it’s reliant on what game ending you pick. 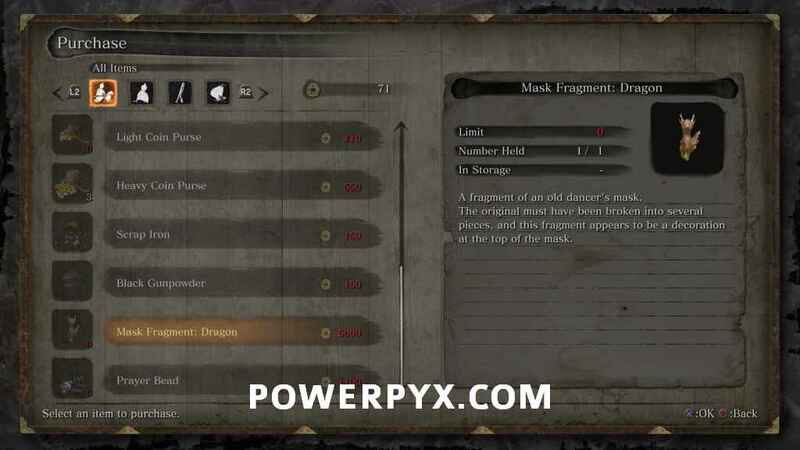 There are 3 parts to the mask: left, right, dragon. They are all from merchants. Two from treasure carp scale merchants (they cost 19 scales total), one from a memorial mob merchant that wants 5000 sen for it. 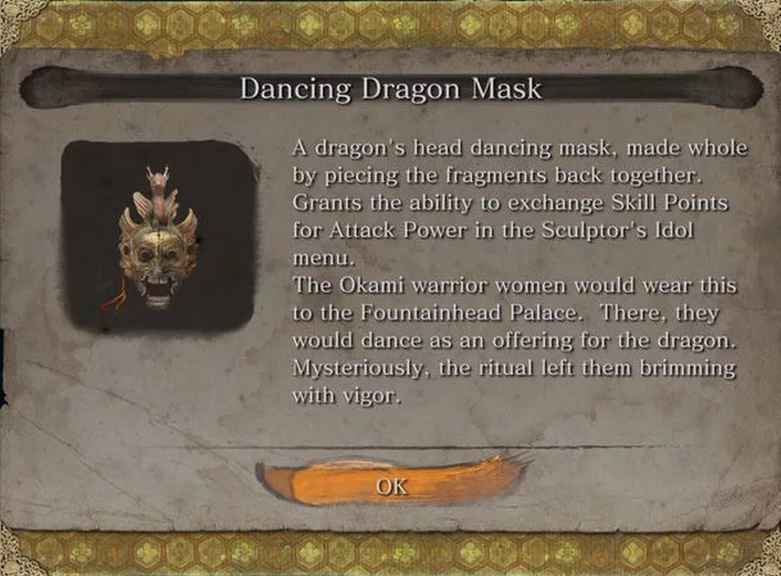 What the Dancing Dragon Mask in Sekiro does: It lets you exchange skill points for more Attack Power. This can be useful to finish up endgame bosses after the story, which are pretty hard to defeat. Unfortunately you can’t unlock the full mask until the very last story area. Hirata Estate – Dragonspring Idol: From Hirata Estate’s first idol called “Dragonspring” jump down the cliffs and you’ll see a bridge on the left and a lake on the right. Swim through the lake an on an island you find a merchant in a barrel. You can buy the right mask fragment from him for 7 Treasure Carp Scales. 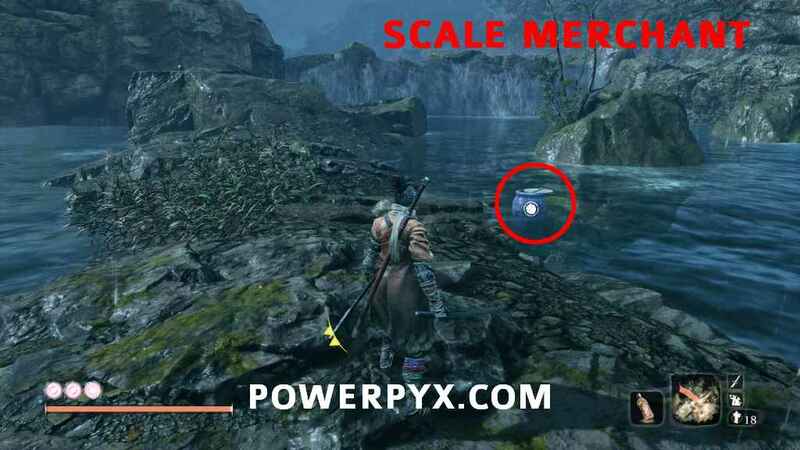 See Sekiro All Treasure Carp Scale Locations. 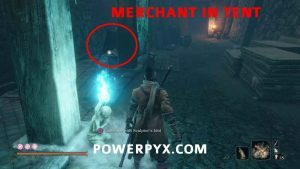 Ashina Castle – Abandoned Dungeon Idol: Just to the left of Ashina Castle’s Abandoned Dungeon idol, you will see a tent with a merchant inside. He sells the mask’s center piece “Dragon” for 5000 sen (money). You can farm this by killing the same group of enemies repeatedly and holding (PS4) / (XB1) to collect the money they dropped. Fountainhead Palace – Palace Grounds: This location is missable, it depends on what game ending you choose. After you defeated the Corrupted Monk and the Guardian Ape you have to return to Ashina Castle and talk to Owl on the Tower Rooftop. He presents you with two choices: to betray Kuro (bad ending) or to stay loyal to Kuro. You must pick the 2nd dialogue to stay loyal to Kuro. The exact dialogue option says “Break the Iron Code. Stay Loyal to Kuro”. 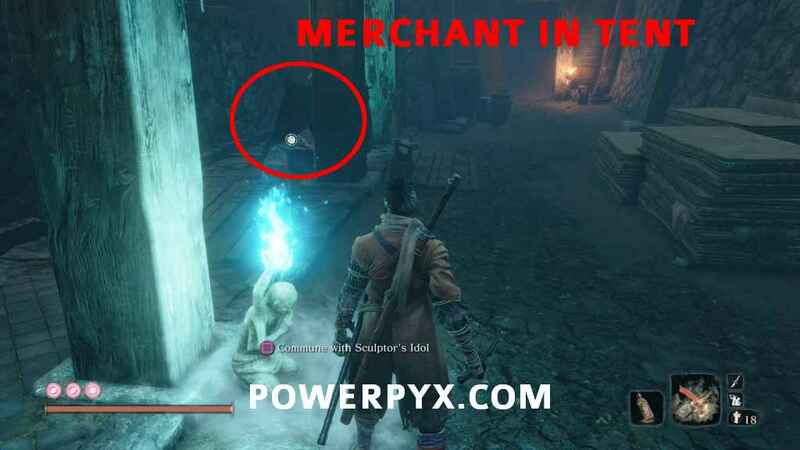 Then you can get ported to the Fountainhead Palace by stepping in the tent at Ashina Depth’s Wedding Cave Door idol. As you progress through the Fountainhead Palace you will automatically reach the Palace Grounds idol (it’s after swimming through an underwater cave, no worries you can’t miss this as it’s the mandatory story path). From the Palace Grounds idol, exit the next door to the left and you’ll see a bridge in front of you and a waterfall on the side. 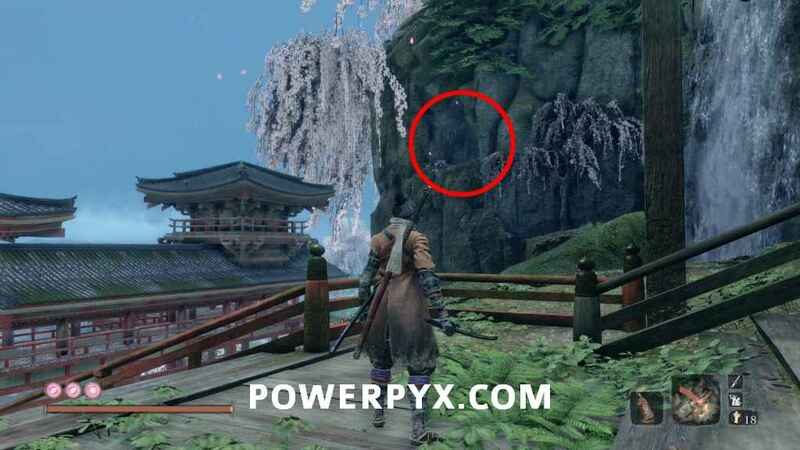 In the cliffs by the waterfall you can grapple up to a secret passage, see the first screenshot below where it’s circled in red. After this cave you reach the Near Pot Noble idol. The Pot Noble sells you the left mask fragment for 12 treasure carp scales. 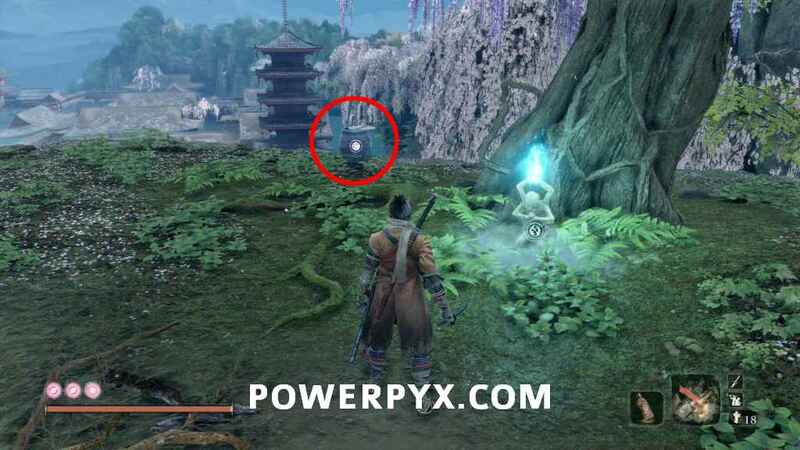 See Sekiro All Treasure Carp Scale Locations. If you already killed the Great Colored Carp and the Pot Noble is dead: In case you poisoned the Great Colored Carp, the 2nd Pot Noble will die. However, you can still get his left Mask Fragment! Here’s how: After having poisoned the Great Colored Carp, its corpse will strand in the Guardian Ape’s Watering Hole (Sunken Valley). Fast travel there and pick up the item (White Whiskers) in front of the carp’s corpse. Then bring this item back to the 1st Pot Noble in Hirata Estate. He will turn into a carp with red glowing eyes himself! He then sells you the left Mask Fragment. With those 3 parts the Dancing Dragon Mask is finished. 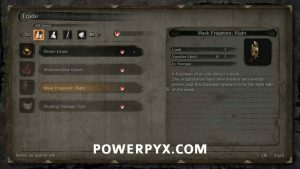 It allows you to exchange skill points for an increase in attack power. The first one will cost you 5 skill points. This is quite useful in preparation for New Game+ but the skill points start to take a lot of XP and if you’re going for trophies / achievements you should better spend them on the skills instead to save yourself hours of farming. It’s a cool option to have nonetheless and there are other main bosses remaining in the endgame where additional attack power will come in handy. 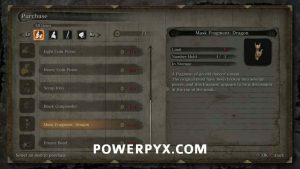 That completes the Mask Pieces in Sekiro Shadows Die Twice, enjoy! Maybe some here can help me with my question. I am almost at the end of the game and I got the dragon mask now. Does anyone know, if it is helpful to spend some xp for attack power upgrades with the mask? 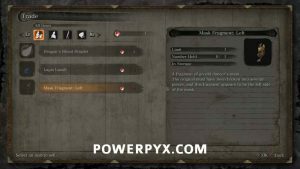 I thought this could maybe help me with the next bosses, but I read that bosses scale up with the level of attack power the player has. Is that true? Thanks and great job with with this guide. I don’t think they scale, at least not before ng+. I initially tried the second owl fight before the 2nd ape fight, and he was steamrolling me. So I gave up and decided to get the extra attack power from ape and ape-girl. When I returned to owl I did notice a bit more damage done with regular attacks. That being said, and based on prior From games, I wouldn’t be surprised if you get depreciating returns when stacking a bunch of extra attack power. I poisoned the Treasure Carp before I ever spoke to the secondary Pot Noble. I just visited the location you described, he is dead in the overturned pot and can not be interacted with. Any ideas, or I’m I fucked?! The 1st pot noble can sell it too if you already killed the great colored carp. I’ll update the exact details in the guide how to do that, thanks for asking! So I gave the white wisker to the npc that was feeding the carp to finish the quest. Now I can’t get the mask because of it?! Am I reading that right?